The castle has it's own vineyard. The 13th century wing houses a glass museum with artefacts from the Romans. 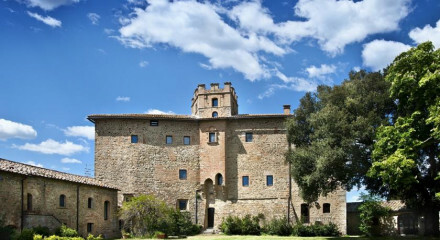 At the centre of Montalcino's biggest wine estate - created by a major US wine merchant in the late 1970s - stands a handsome castle of medieval origins. Just outside its walls, a pretty hamlet (or borgo) of former estate workers' houses has been turned into a 14-room hotel. Fantastic traditional Tuscan dishes and an Enoteca stocking wine from its 7000 acre wine estate. Utterly romantic in location, decoration, and ambience. Panoramic views of the hotel's vineyards around.